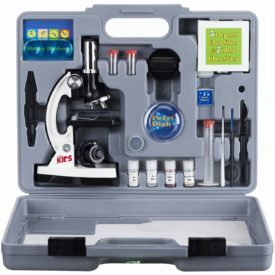 This science microscopy kit includes a great beginner level biological microscope equipped with advanced features and all the necessities of accessories. The microscope features six magnifications of 120X, 240X, 300X, 480X, 600X and 1200X, a single coaxial coarse focus knob, a specimen stage with two built-in stage clips, and a nature light and/or LED illumination system. The kit comes with sample slides, cover slips, plastic tweezers, a plastic scalpel, specimen vials, adjustable lenses, collecting vials, plus a sturdy hard case for easy storage and travel. The microscope has a durable metal arm that makes it a great value. This set is great for beginning scientists.